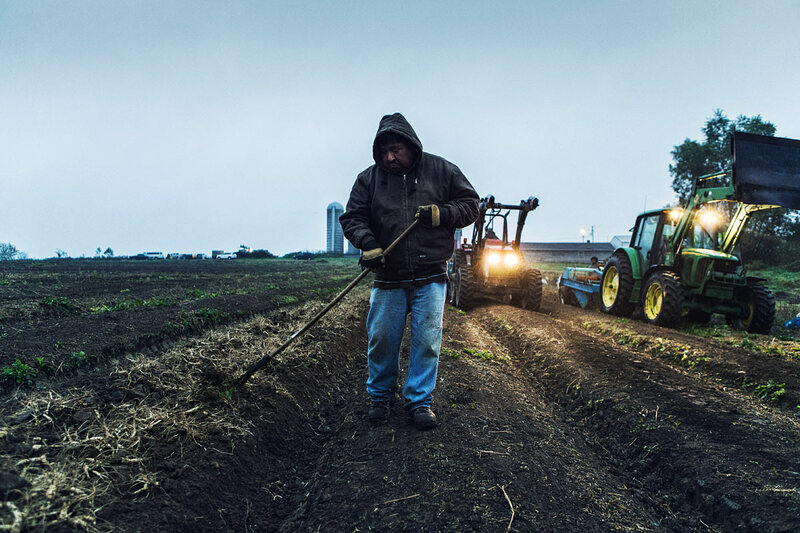 We all know Wisconsin is known for it’s farming communities, rich land for crop growth and vast dairy cow operations. 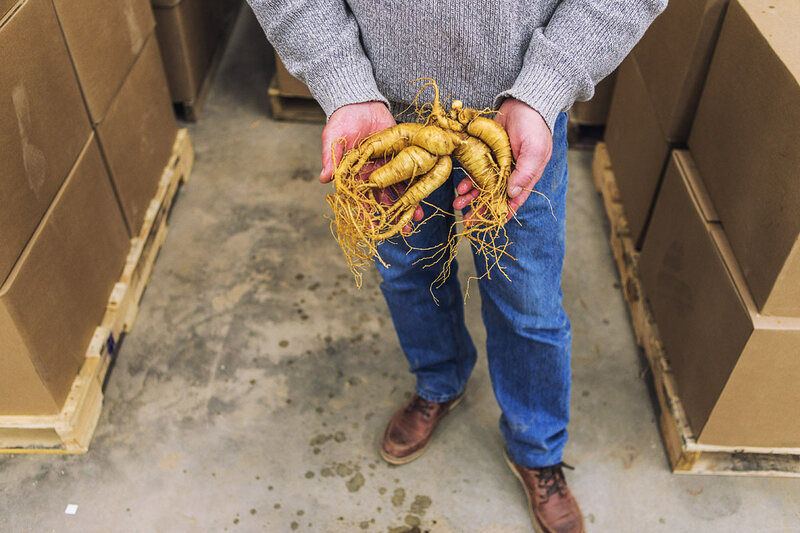 But perhaps a little lesser known agricultural aspect of our state, is that Wisconsin produces the most ginseng found in the United States. 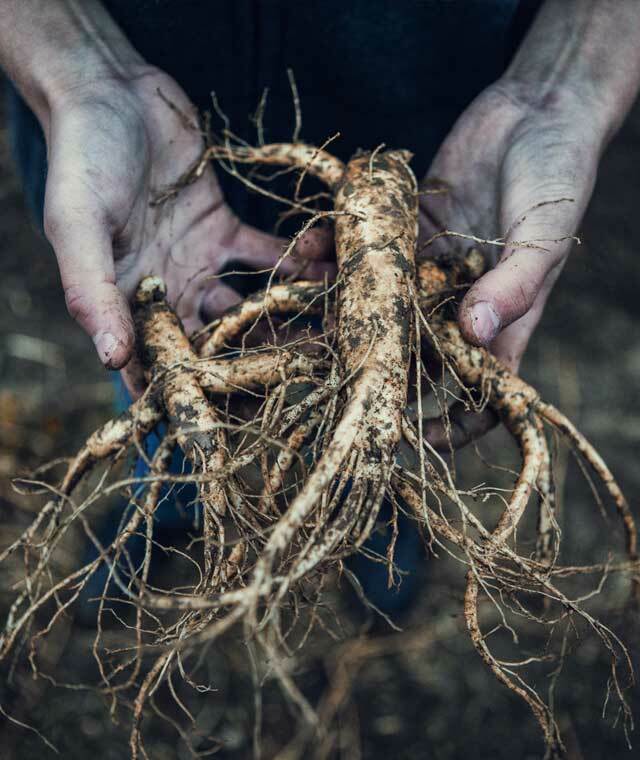 Climate, soil quality and the geography in Wisconsin make ginseng growth and production ideal for producers in the nation. 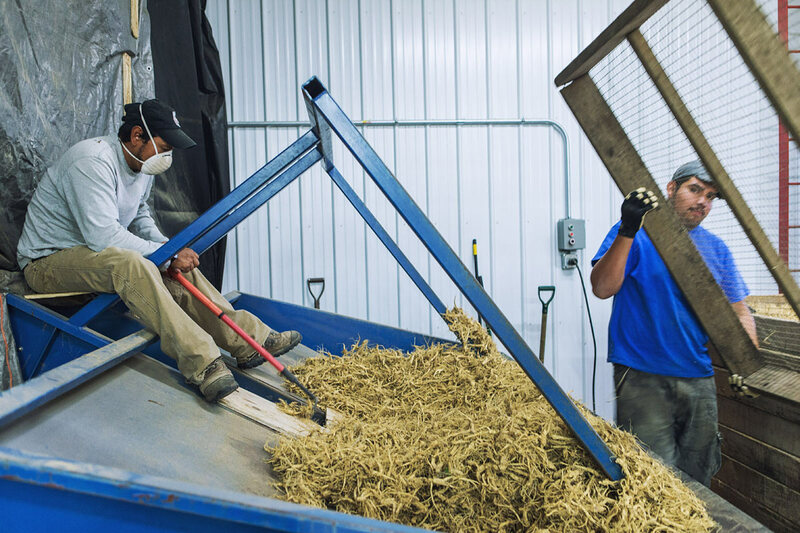 Ginseng farming has developed substantially over the years, with farms becoming more automated and technologically advanced. 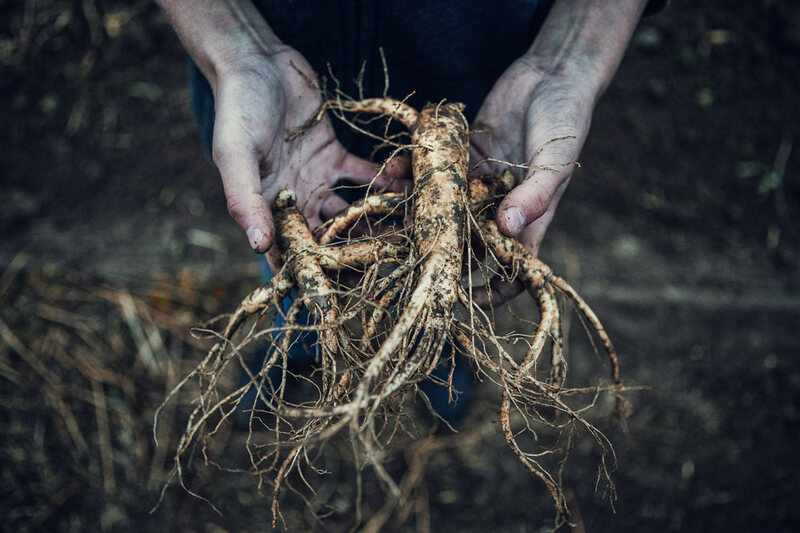 Buyers from many foreign markets have created huge demand for ginseng roots in recent years, primarily for it’s all-natural health benefits as a dietary supplement and use in eastern medicine. 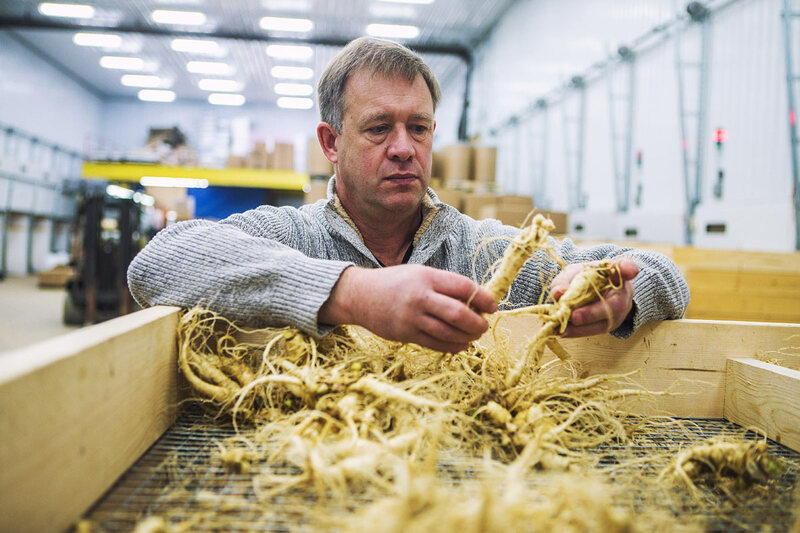 The largest producer of ginseng roots in the United States is Baumann Farms, located in Wausau, WI. 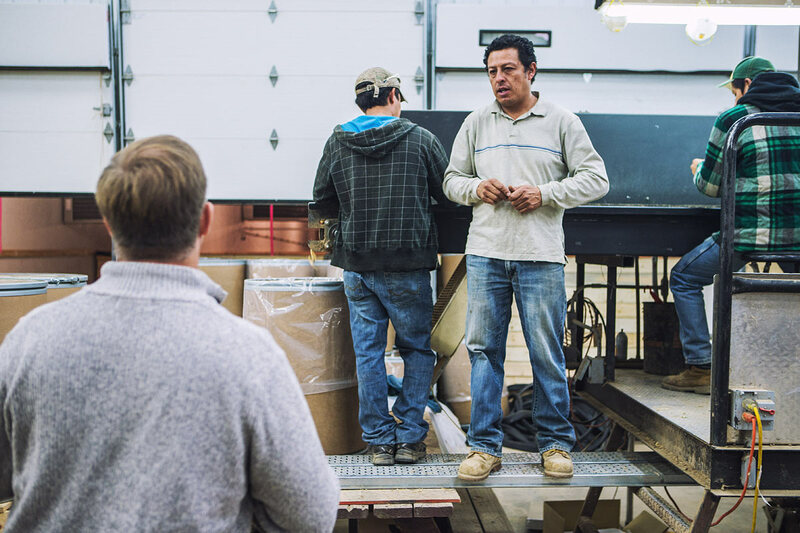 Our team was brought on a project late last fall to document their production process and facilities to be implemented in marketing materials and boost their worldwide brand. 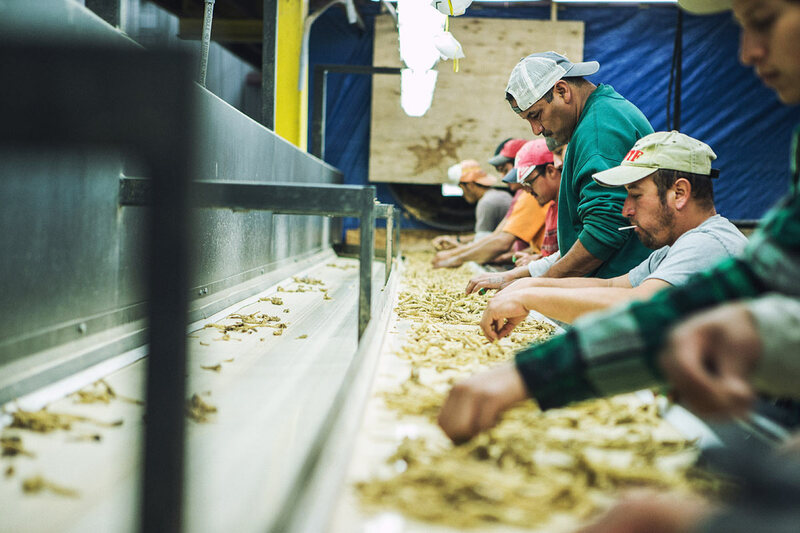 We traveled to one of Baumann Farms many ginseng gardens and production facilities to shoot the operation from beginning to end. 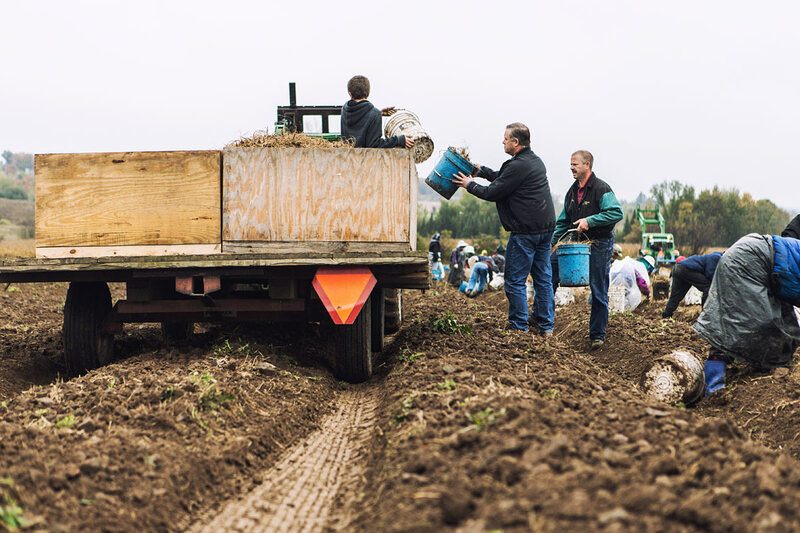 Baumann Farms is a family owned and operated business, which has been in the family for many decades. 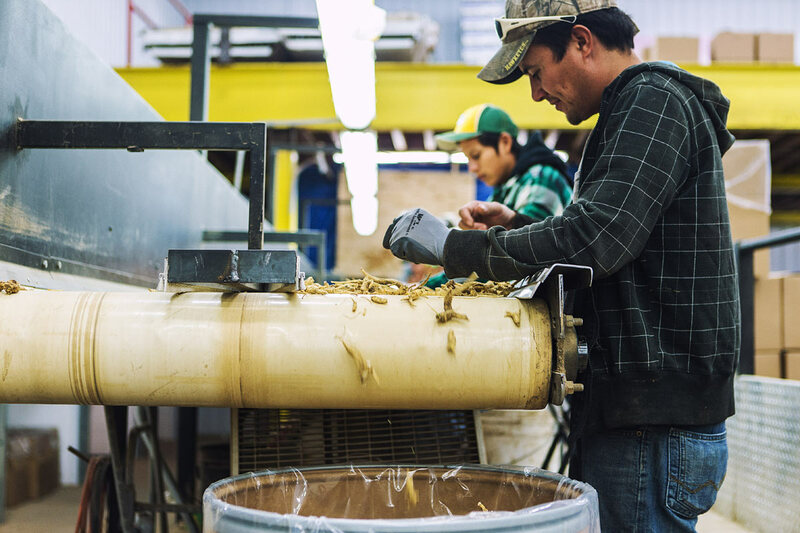 The family prides themselves on this fact and they are very hands-on in all aspects of the production. 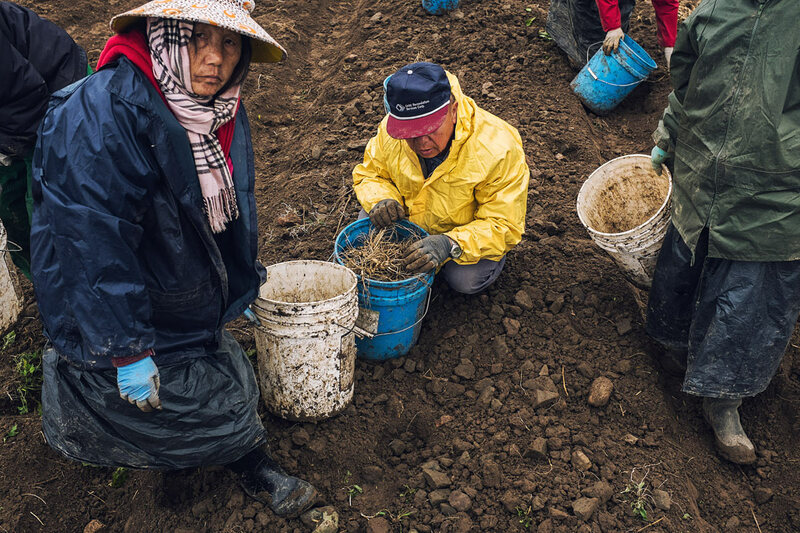 Young and old, they have weathered some tough years through hard work and dedication to make them the largest and ever-expanding ginseng farm in the country. 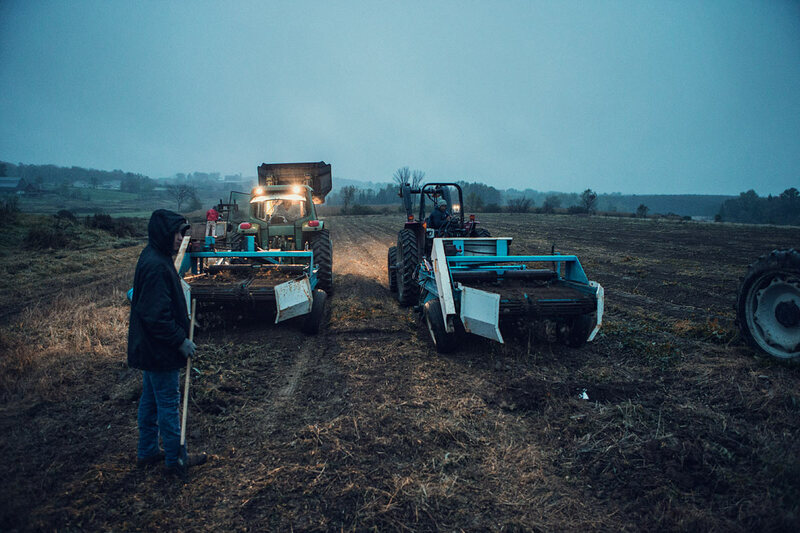 Most mornings in the ginseng gardens begin at 5am. 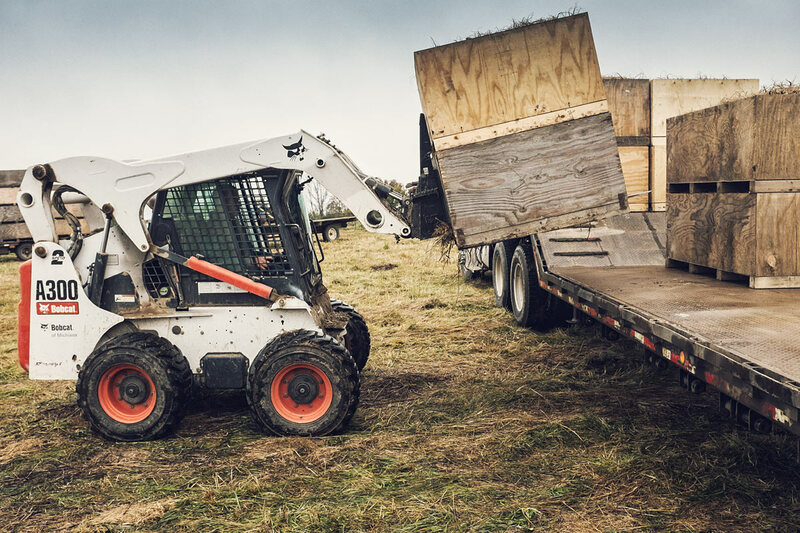 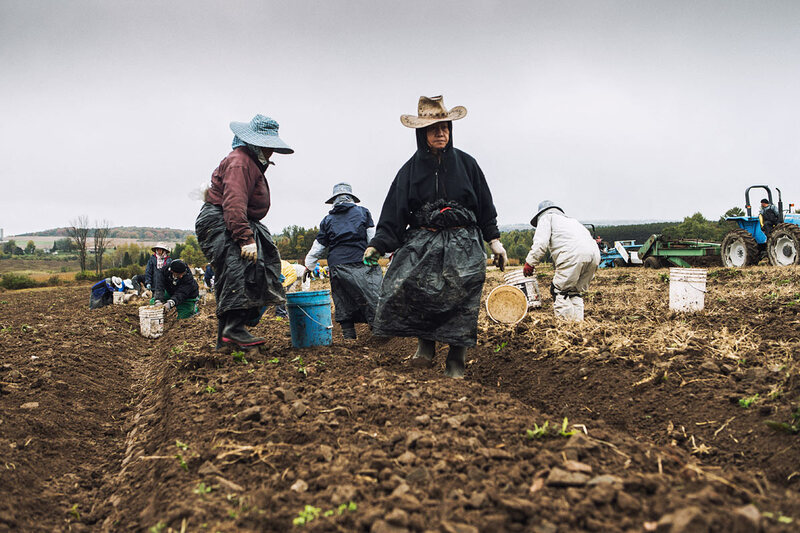 The weather is typically cool and rainy in early fall and the workers come prepared for the day. 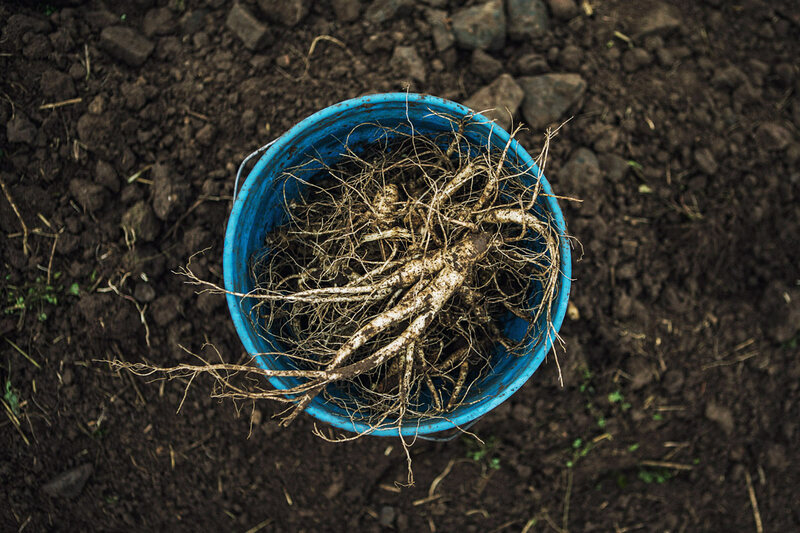 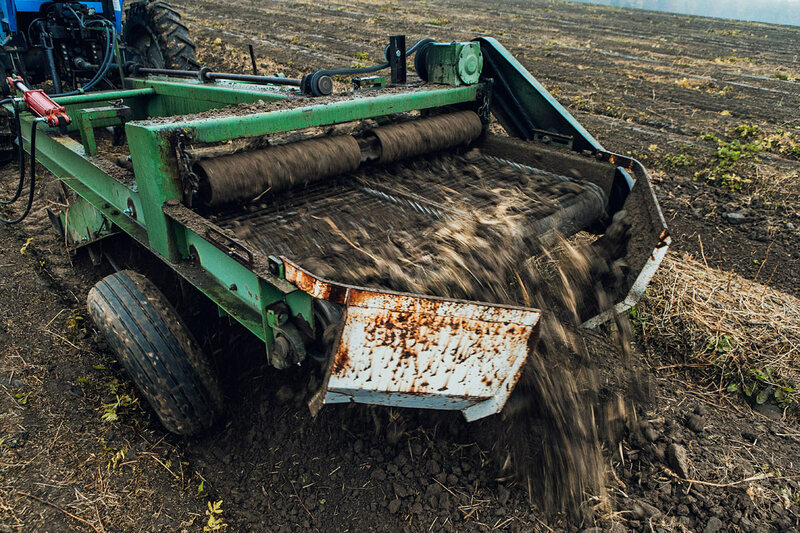 The ginseng roots are harvested from the ground and the soil is turned loose/sifted in rows. 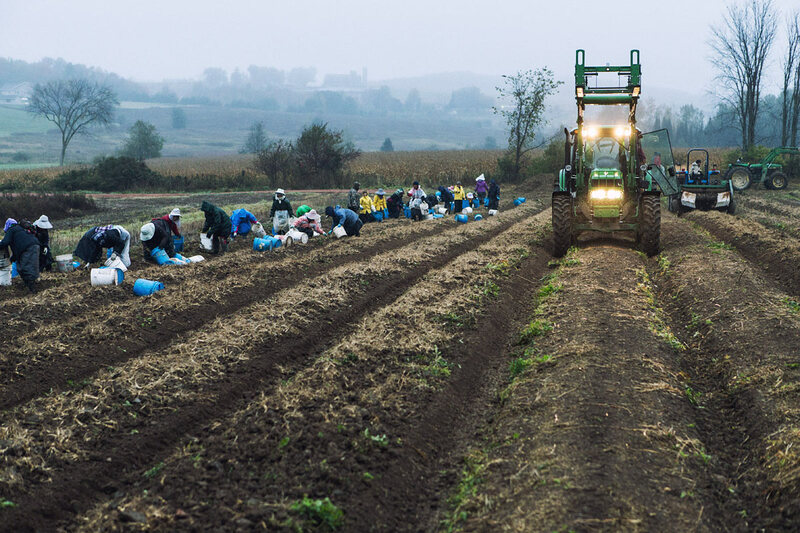 The workers then rake each row of roots by hand to prepare for collection. 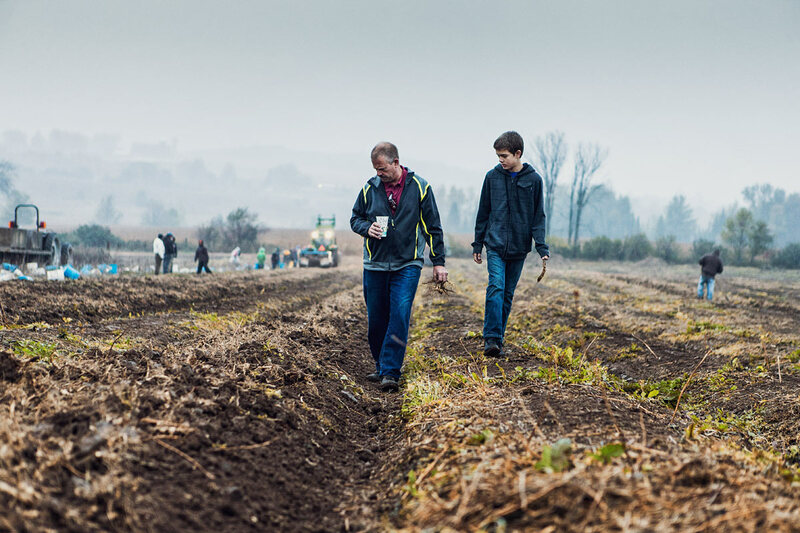 Kraig Baumann and his son walk the rows to inspect the quality of the roots from each field. 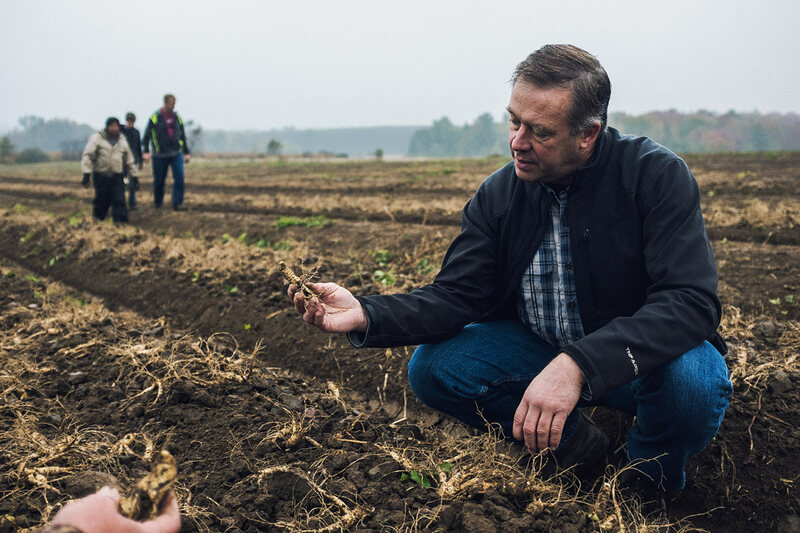 Kurt Baumann takes time to talk to us about the ginseng harvest. 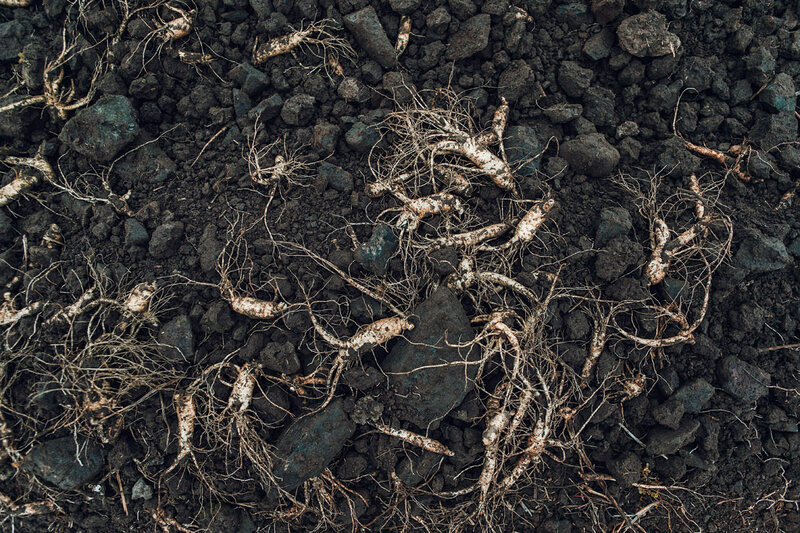 This year had an especially good crop, based off the size of the roots. 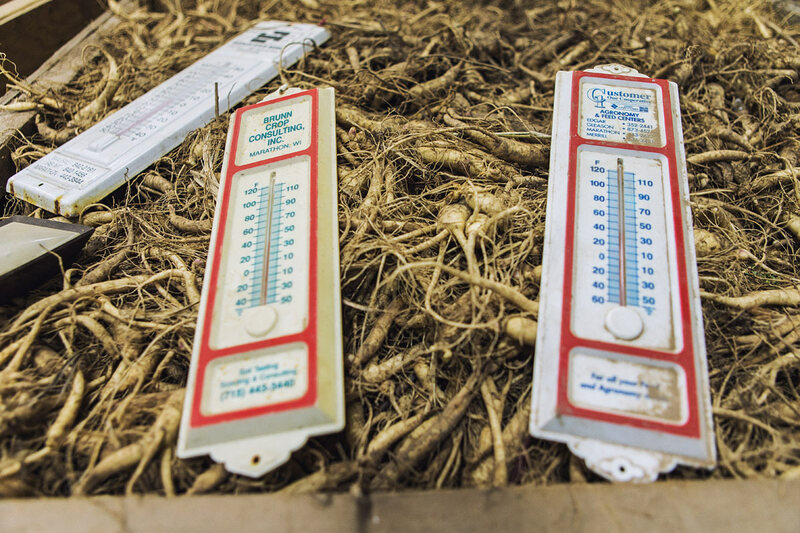 Ginseng has high value in foreign markets. 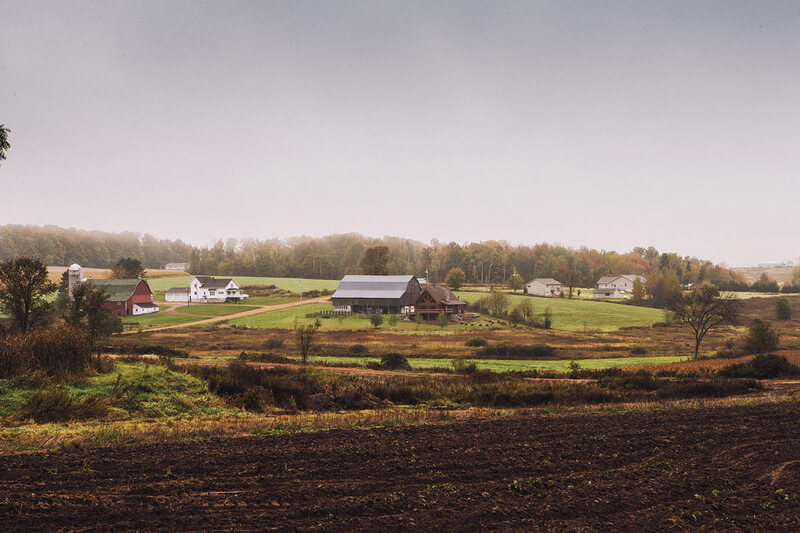 Some years, better than others.. but this year yielded great results. 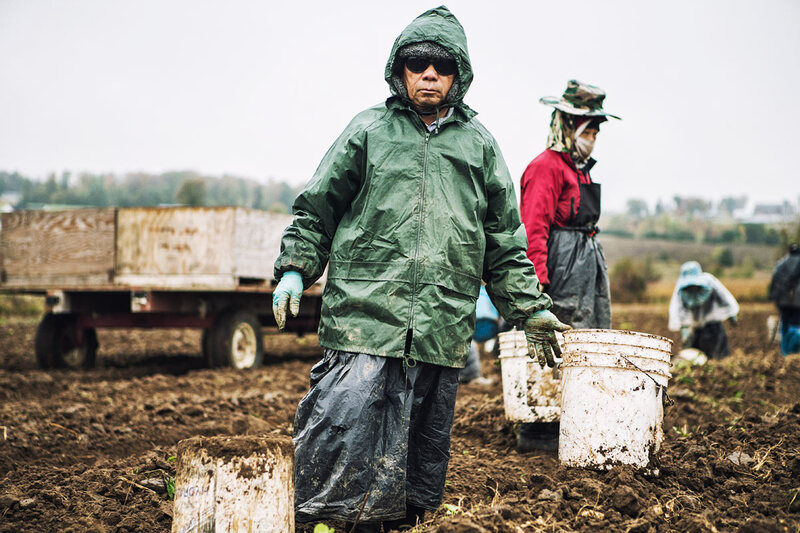 Baumann Farms employs many migrant workers from Mexico, many of which have been with the farm for several years. 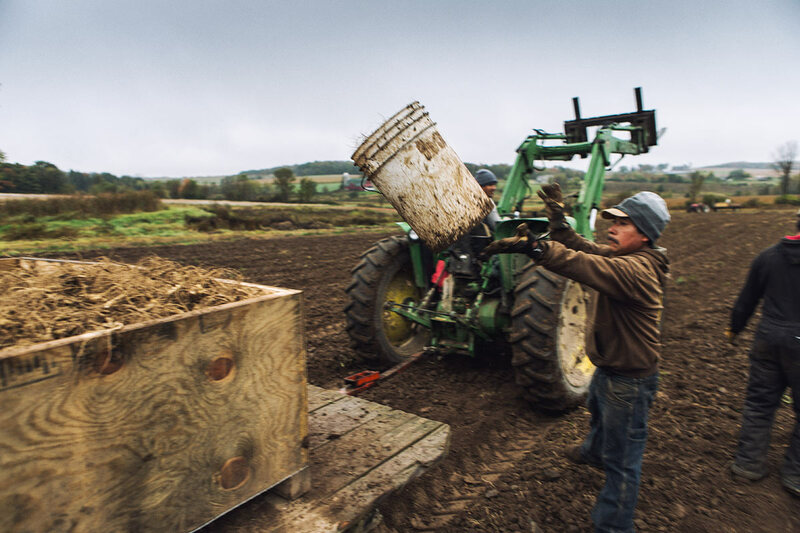 Wisconsin’s climate, soil quality and the geography make ginseng growth and production ideal for producers. 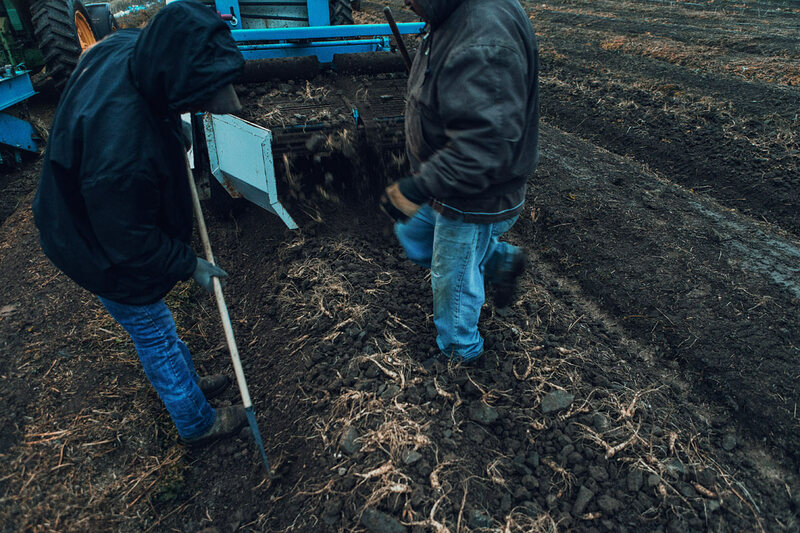 The Baumann family prides itself on being a family owned and operated farm. 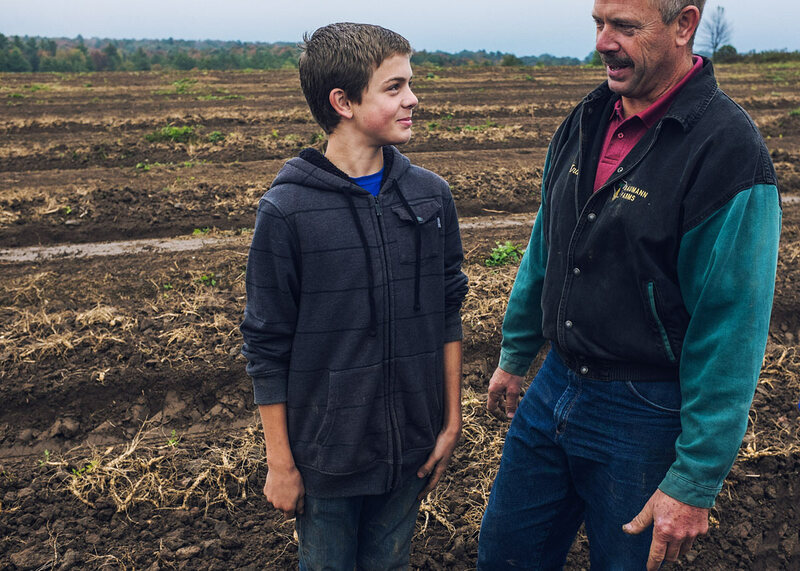 Kraig’s son will someday take over the farm. 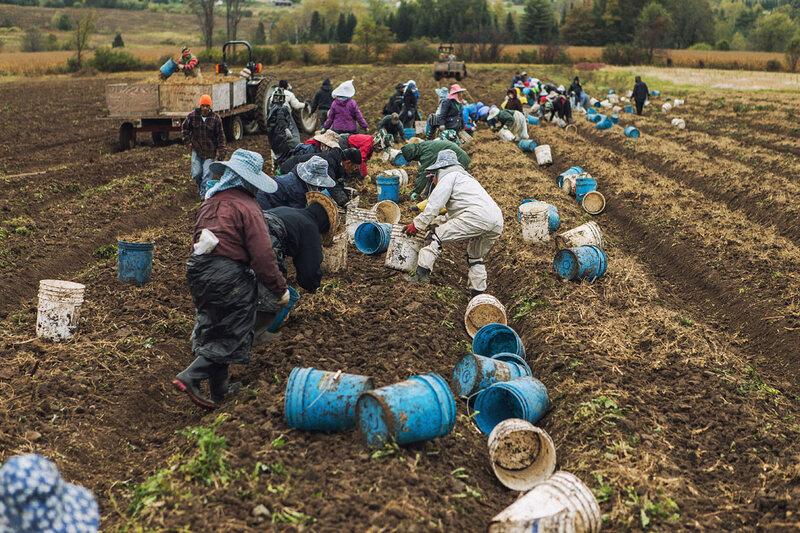 Baumann Farms also employs a large group of Hmong workers to help during the harvest season. 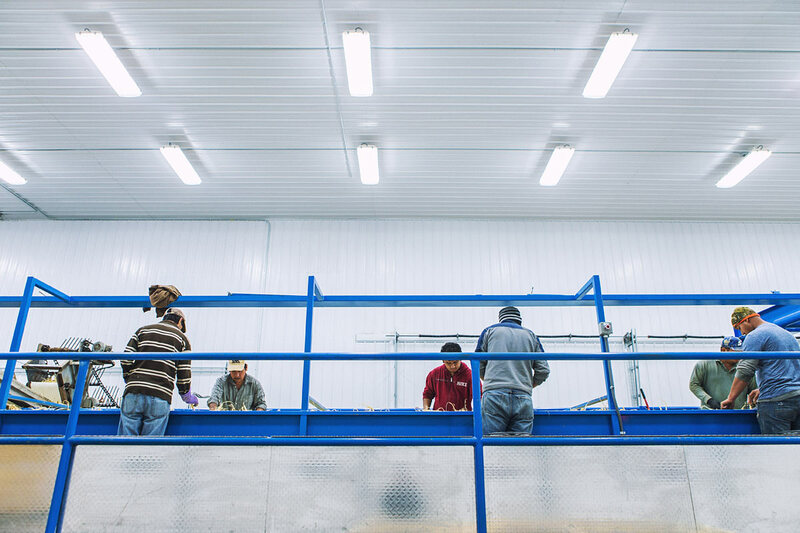 The workers are like family to the Baumann’s and are treated exceptionally well, many being housed on their property throughout the year. 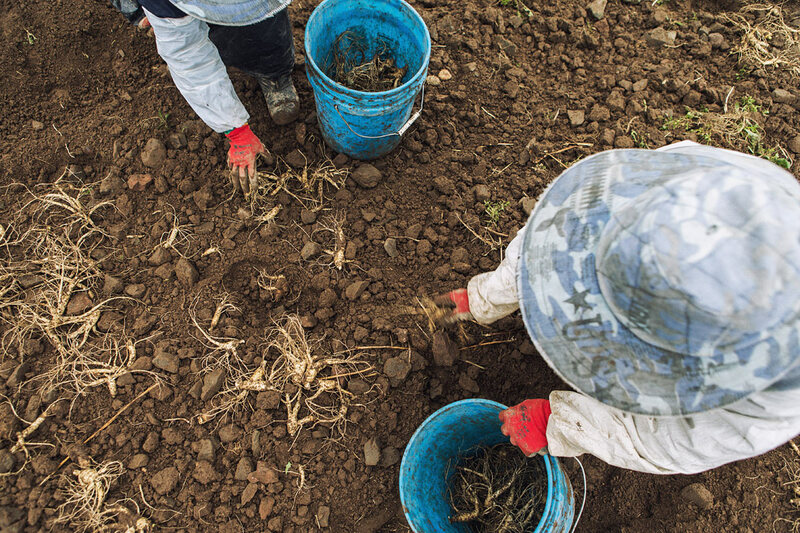 They work long hours ever day, but constantly show an incredible work ethic. 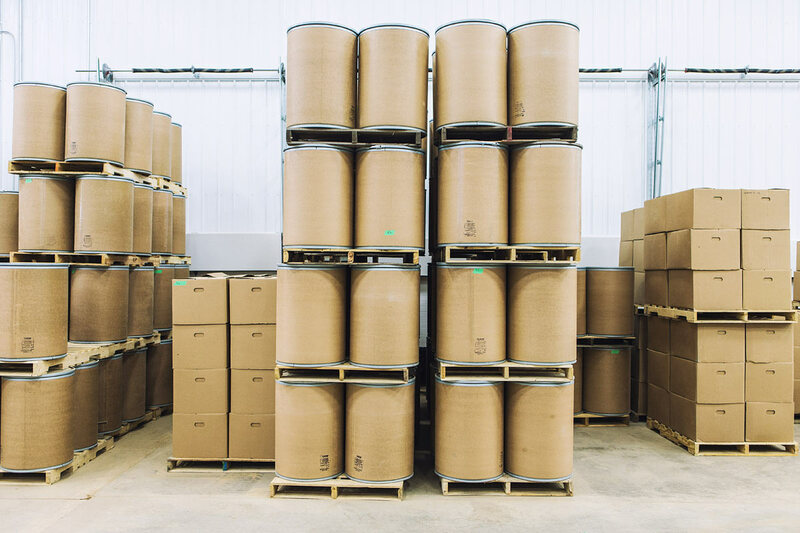 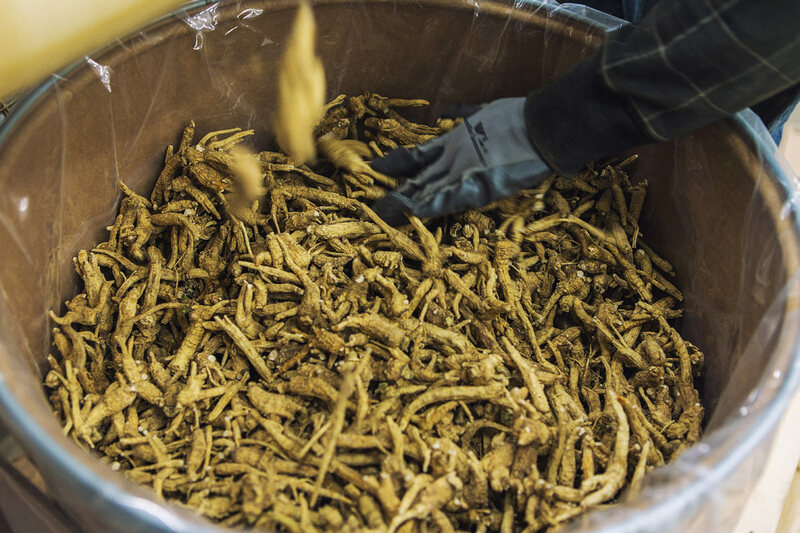 The ginseng roots are all collected by hand, placed into 5 gallon buckets to be loaded into wooden boxes. 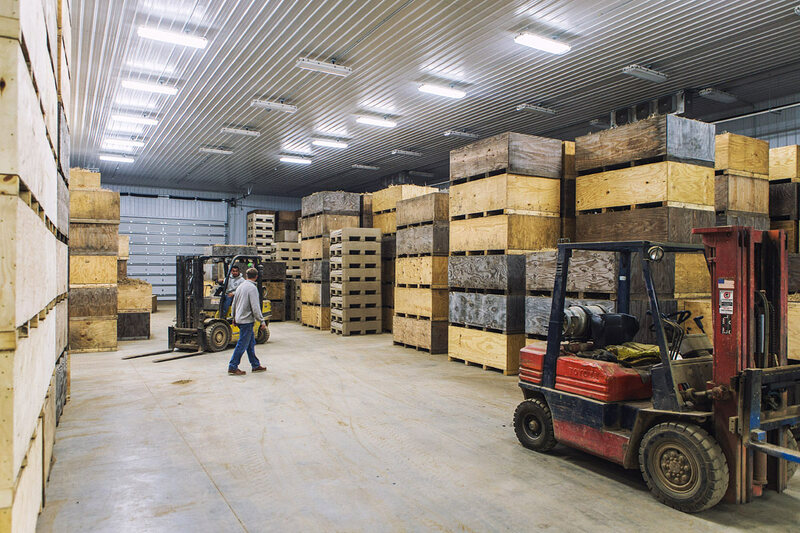 Once the wooden transport boxes are filled, they are loaded onto a flatbed semi trailer and transported to the processing facility several miles away. 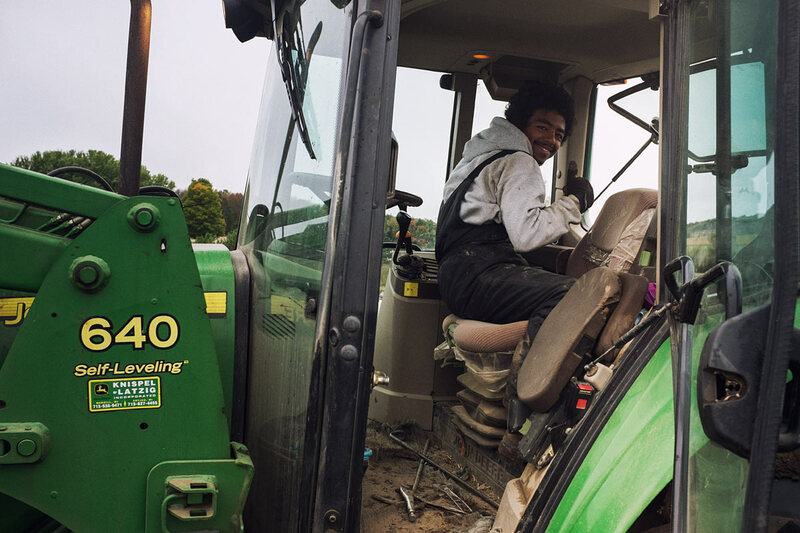 Here is a portrait of Alex, a veteran foreman for 12 years at Baumann Farms in Wausau, WI. 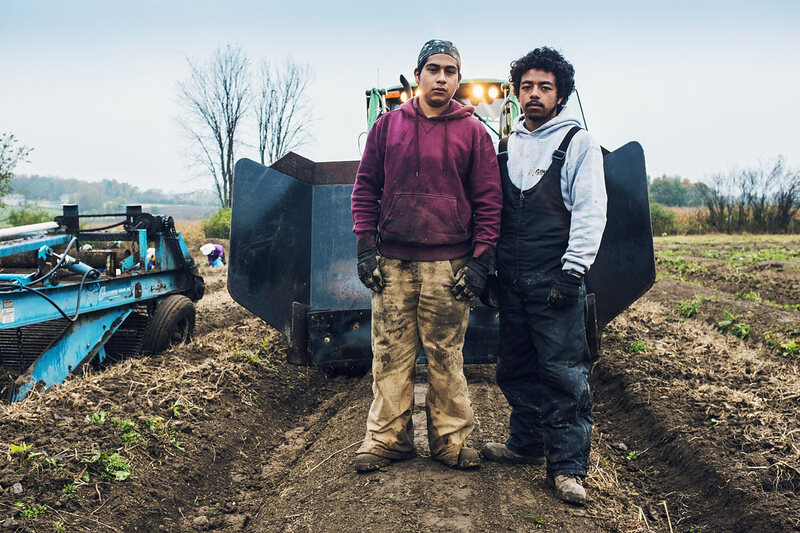 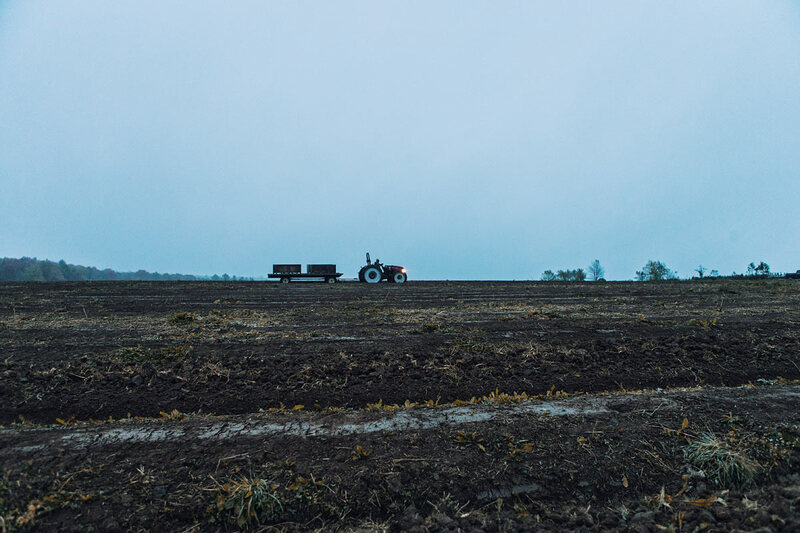 He has been traveling to the United States from Mexico every year and has risen up the ranks on the farm putting in 12-16 hour days managing a huge crew. 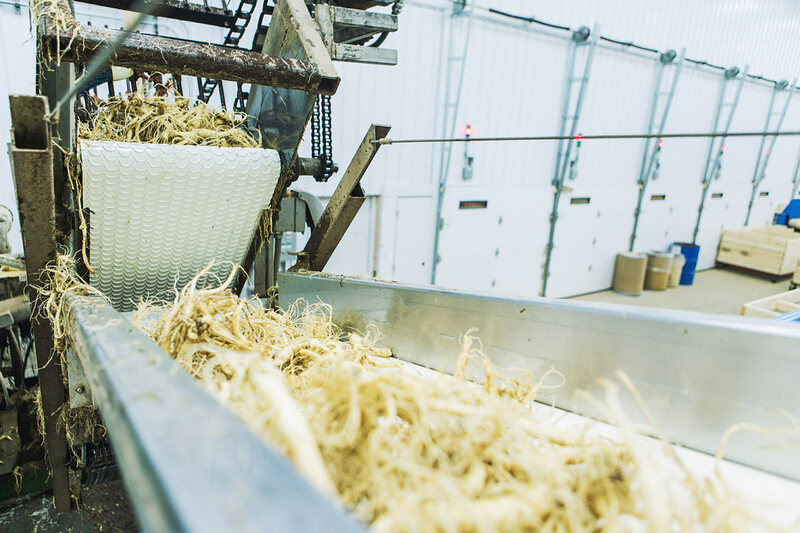 Baumann Farms is the largest producer of Ginseng in the US. 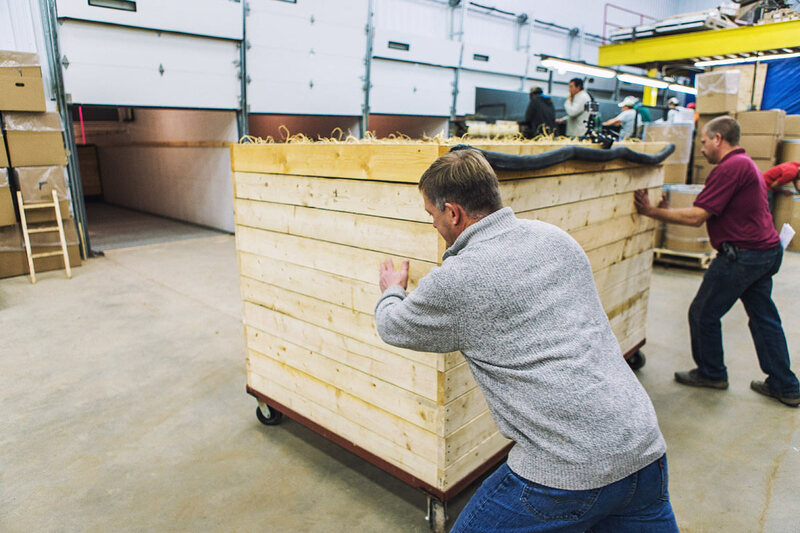 The ginseng root arrives at the Baumann Farms production facility in Wausau, WI. 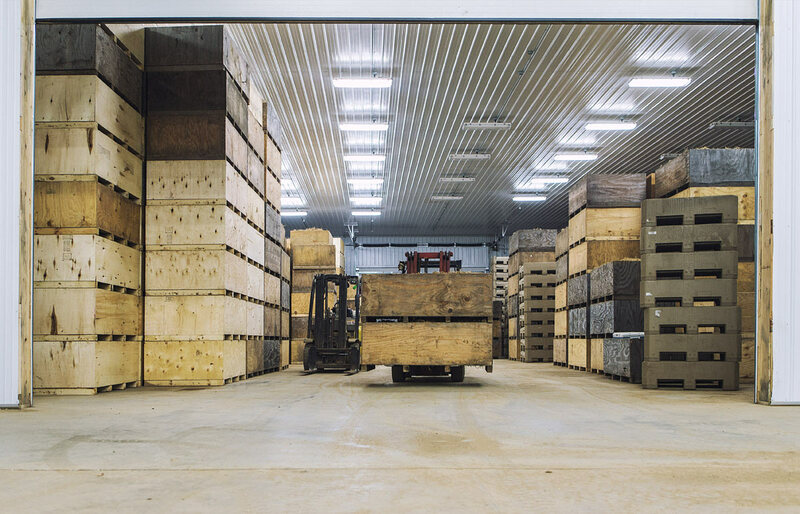 They are stored in a state-of-the-art refrigeration warehouse, kept at a consistent 38 degrees before they get processed. 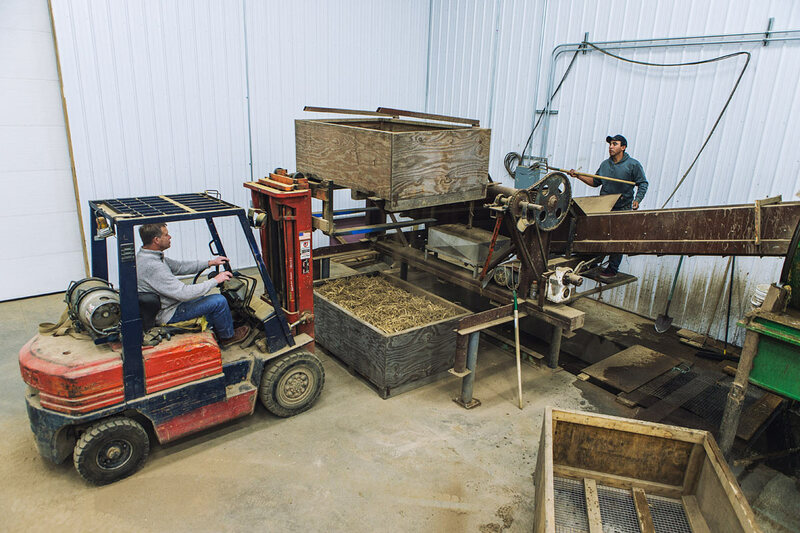 Processing begins at Baumann Farms. 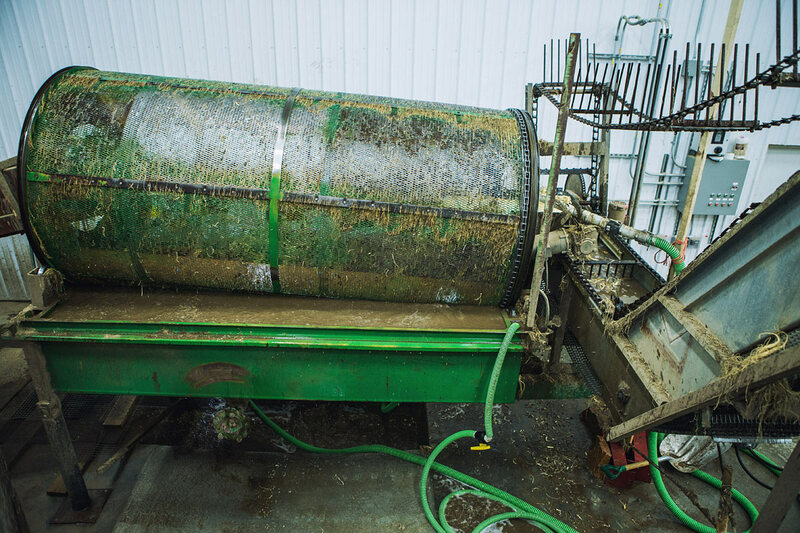 The roots are loaded onto a conveyer belt and washed. 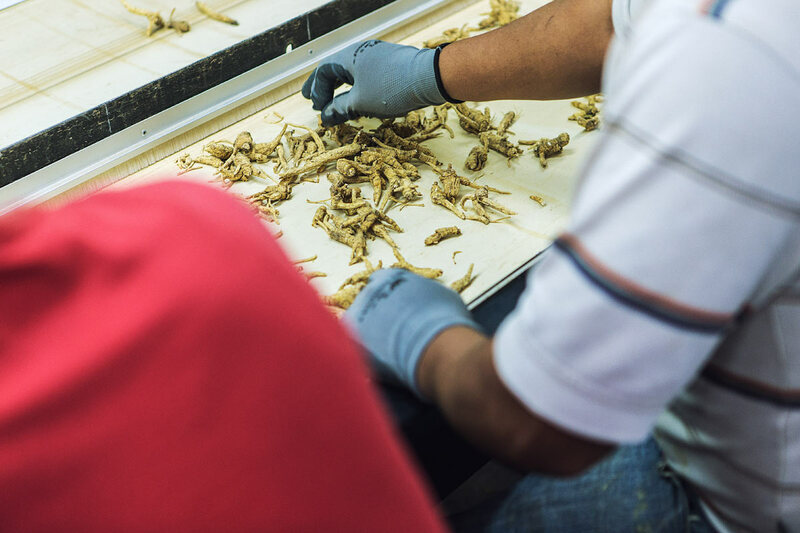 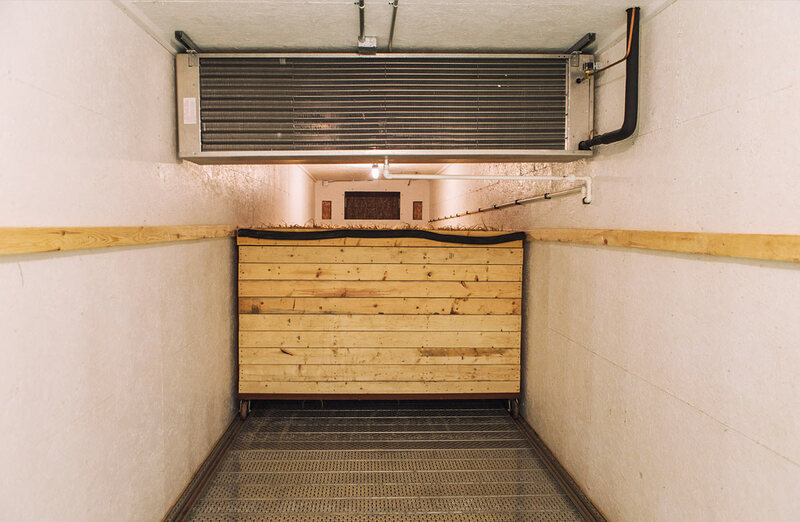 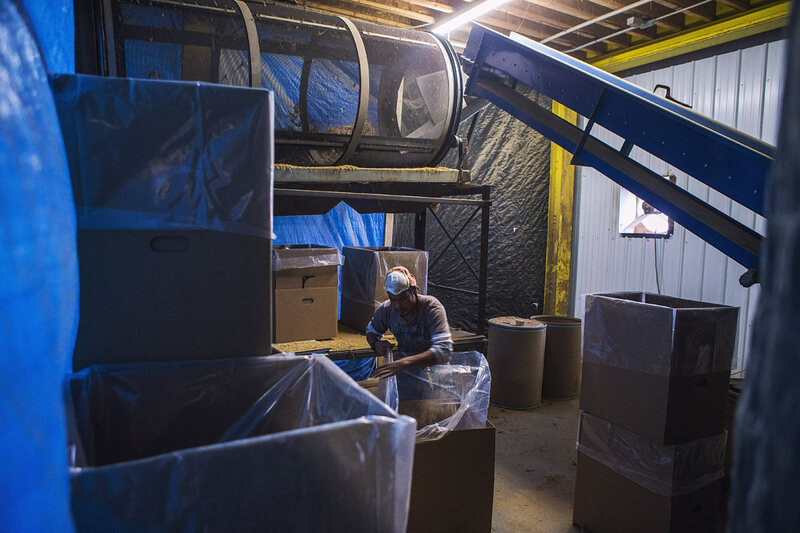 Some of the equipment inside their facility has been homemade and hand-engineered to fit the Baumann’s specific process of curing/preparing the ginseng. 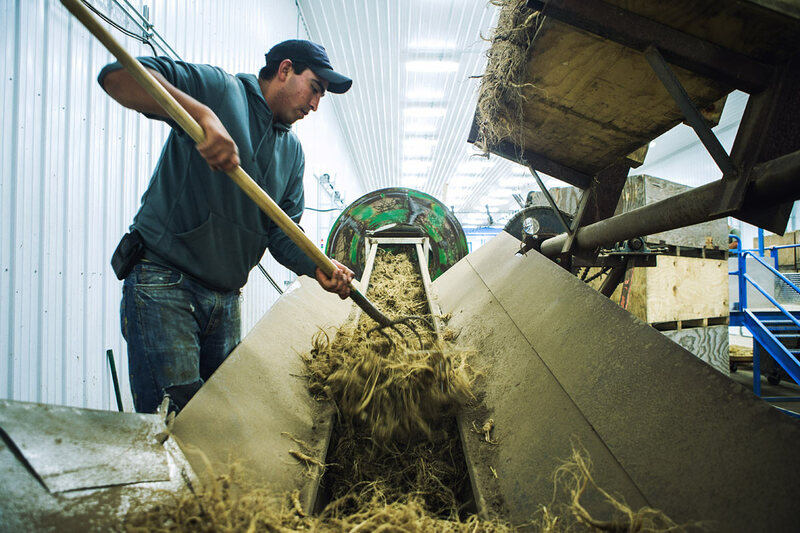 Once washed, the roots are moved to a secondary station where they are sorted by hand for quality assurance purposes. 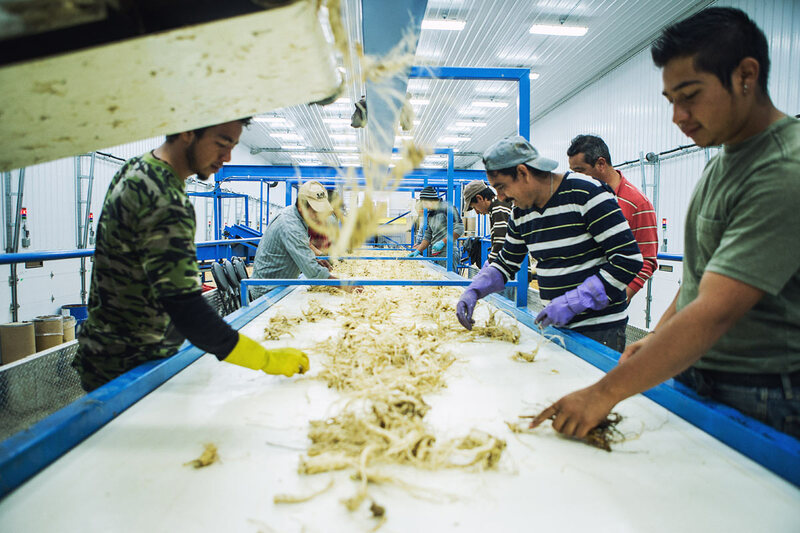 At this stage, the workers remove any bad produce from the initial sort. 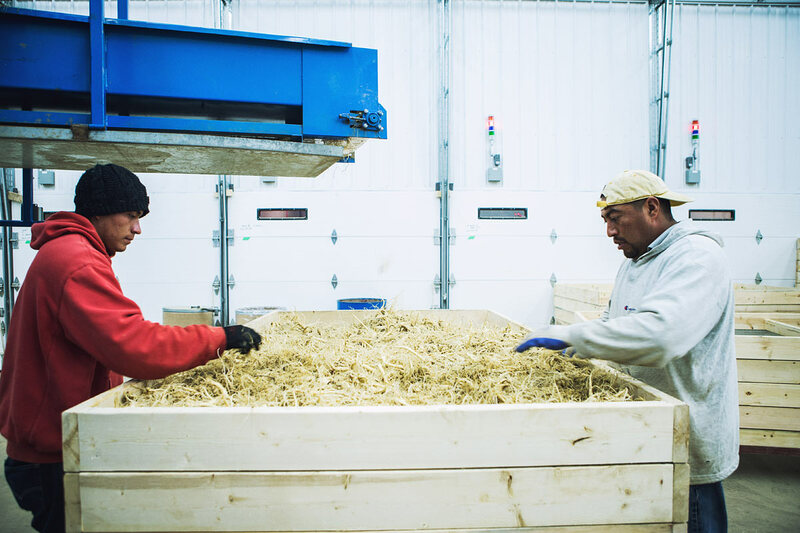 The ginseng is then placed back into wire-bottomed wooden boxes for drying. 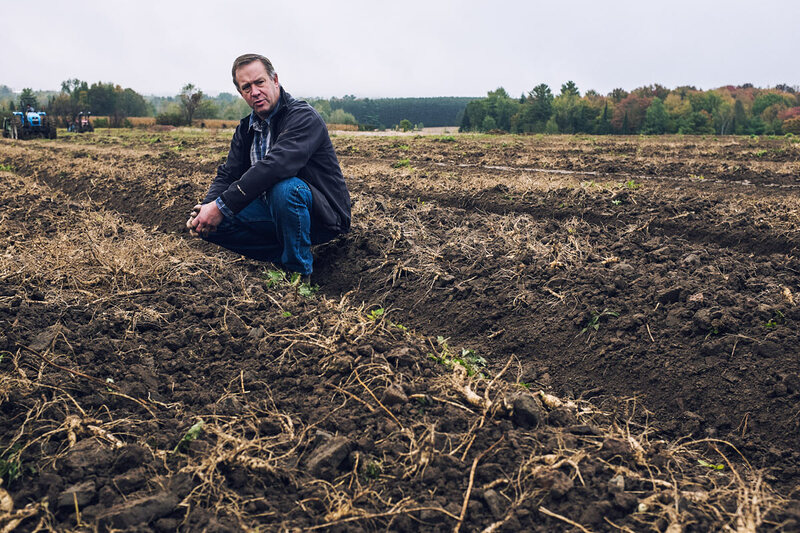 Kurt Baumann takes a moment to inspect the quality of roots from the harvest. 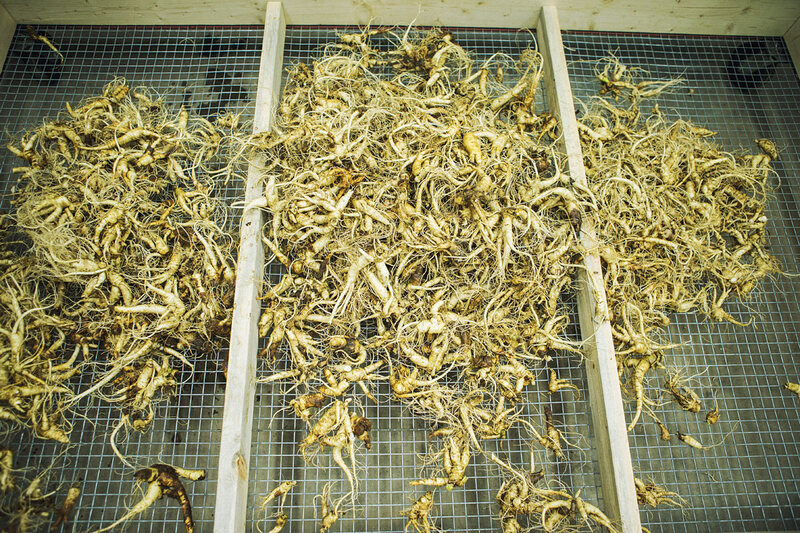 The cleaned and sorted ginseng roots are placed in drying kilns for several days. 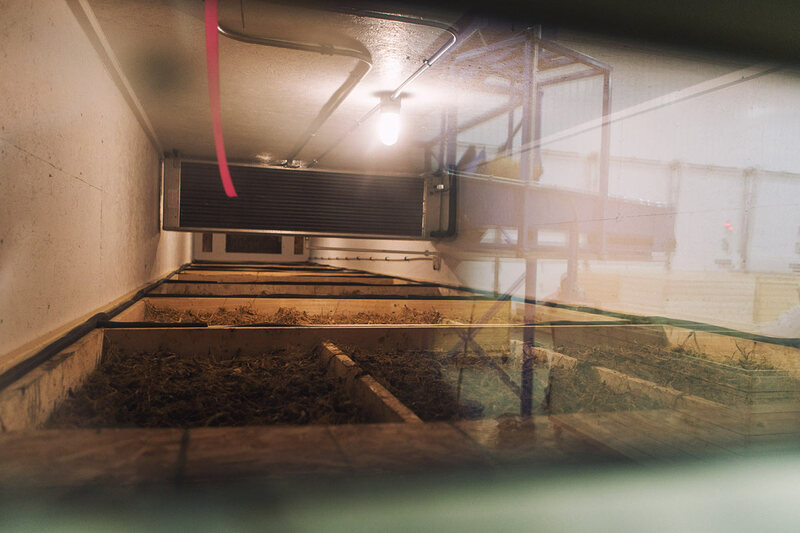 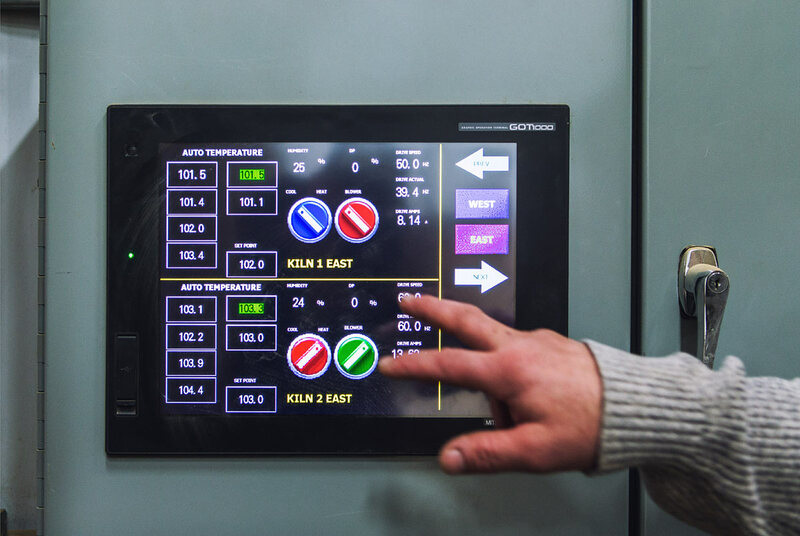 Baumann Farms has a state-of-the-art facility, including a computerized system for temperature control during the drying process. 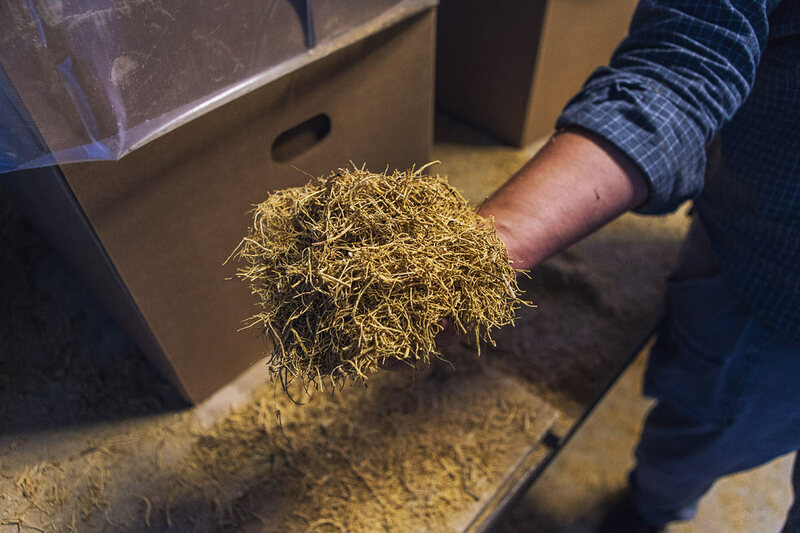 Once dry, the roots are re-sorted, sifted to remove excess root shag and packaged for shipping. 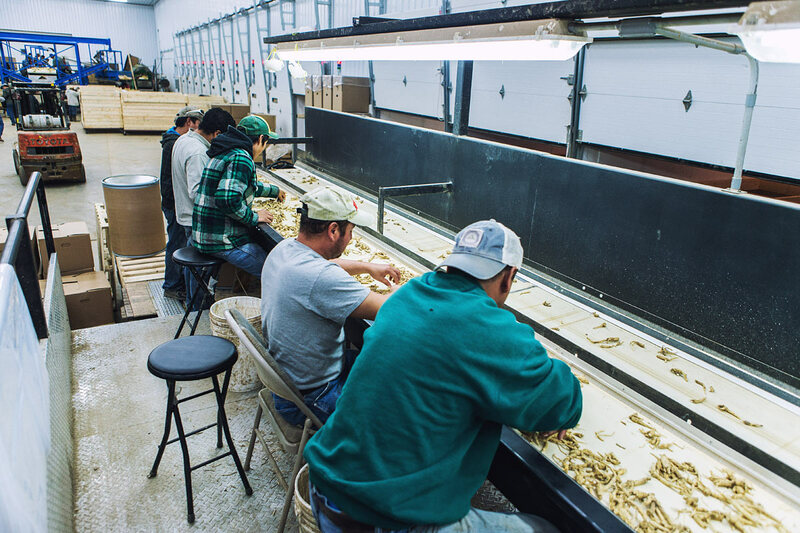 Ginseng wholesalers and buyer from around the world travel to Baumann Farms to inspect the final product. 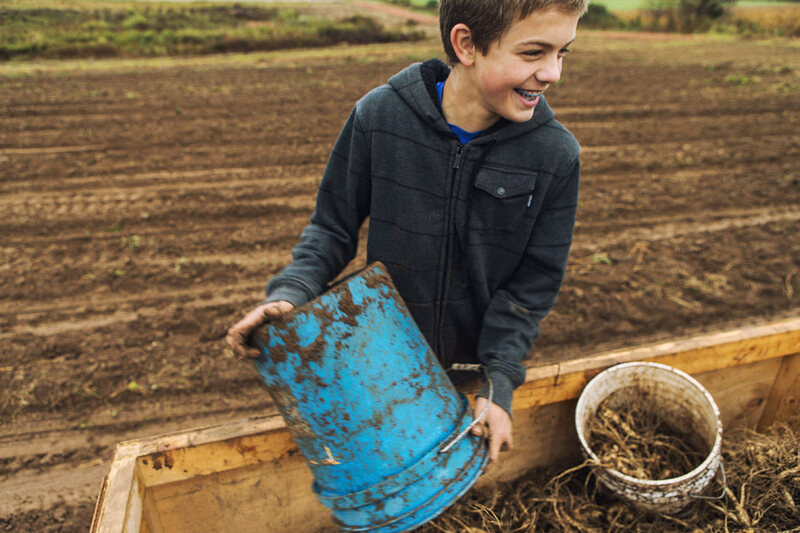 A harvest from a single garden can be worth a few million dollars. 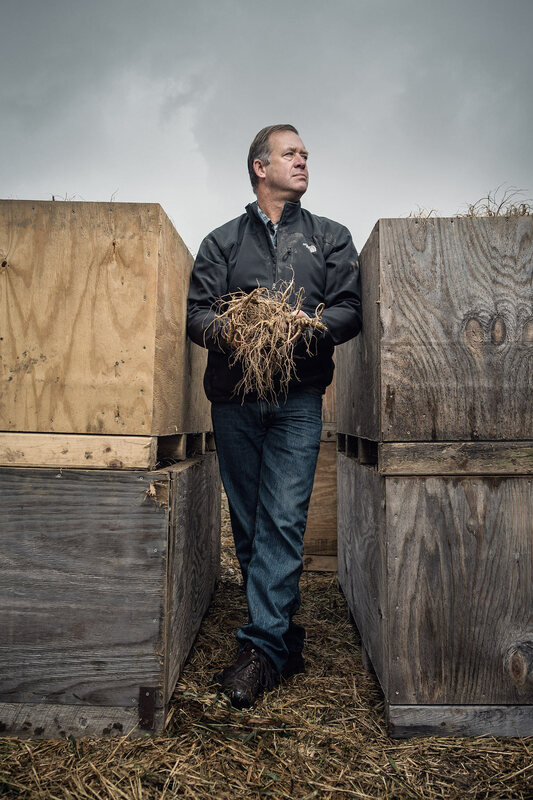 This rare/enormous root alone, displayed here by Kurt Baumann, can be valued in excess of $10,000 by itself. 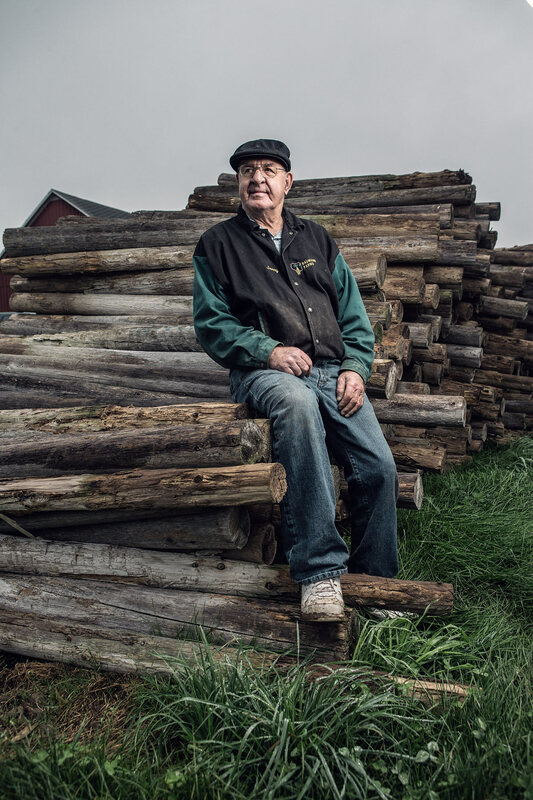 Portrait of Jerry Baumann, original founder of Baumann Farms in Wausau, WI. 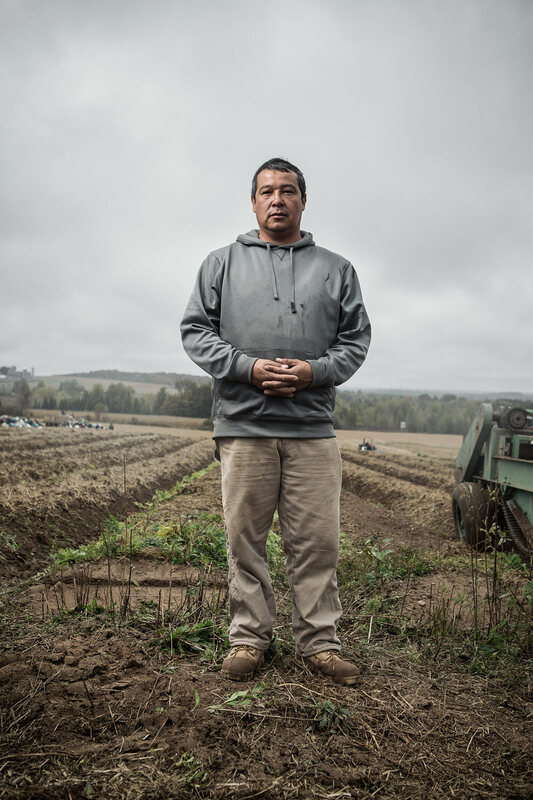 Portrait of Kurt Baumann, co-owner of Baumann Farms in Wausau, WI. 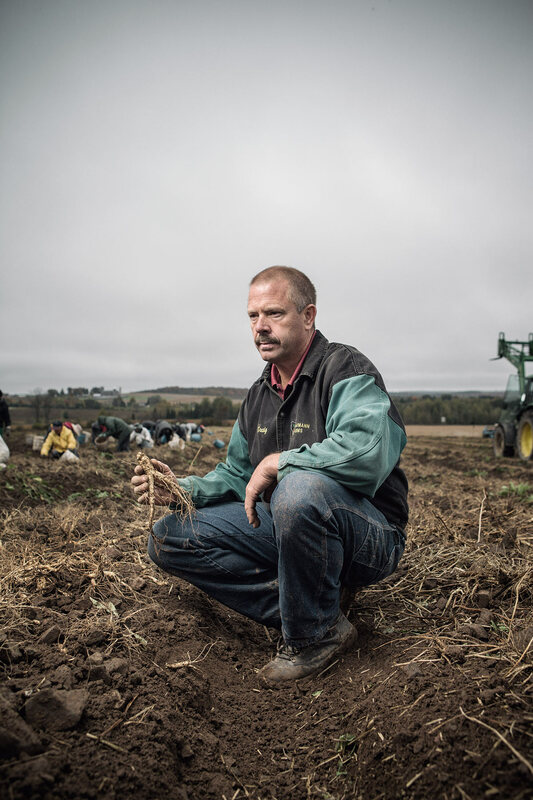 Portrait of Kraig Baumann, co-owner of Baumann Farms in Wausau, WI. 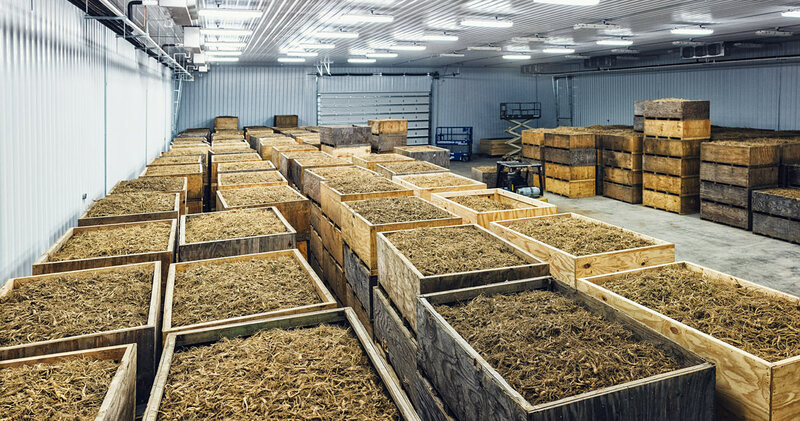 Baumann Farms is the largest producer of Ginseng in the US. 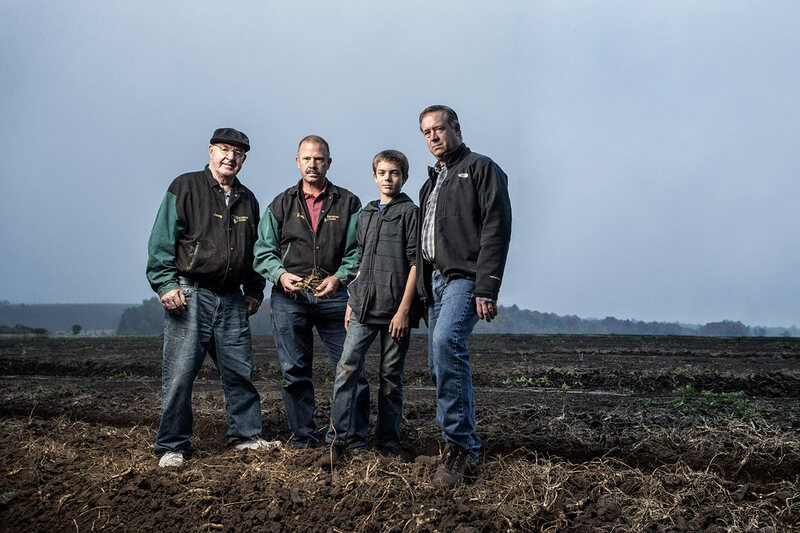 Portrait of the Baumann family, three generations of ginseng farmers.. past, present and future.